Android has made a special place due to its awesome theme platform updates. With the help of Android development, you get new applications. In order to promote your business, you need professional Android app development services. Are you searching for one? Haven’t found yet? Keep calm! Interact with our experts at UAE Technician and give your business the boost that it needs. As a renowned Android app maker in Dubai, we provide you with necessary strategies as per industry standards. Our service is designed as per your interests. Hence, feel free to reach us. Android has a wide application in expanding your business. You can reach out to more customers across a number of smart devices in the same platform. Be it affordability or customer engagement, Android development meets all your needs. To enhance the visibility of your business you need Android app maker in Dubai to continue your important work. As Android applications are written in Java programming language which supports a number of libraries, you can easily adapt to Android applications. Besides, it is easy for you to write applications for Android. Android platform is open source which means that you need not worry about licensing costs. In short, Android development has a greater prospect for your business. When you use Android development, you do not have to rely on a single market for distributing your application. The best part is that you build your application as well as publish it. Lastly, you can reach your clients with the help of multiple channels. You can generate your business revenues with the help of application purchase, subscriptions, advertisements, e-commerce, etc. If you need services for Android app development in Dubai, it is essential for you to contact our experts at UAE Technician. 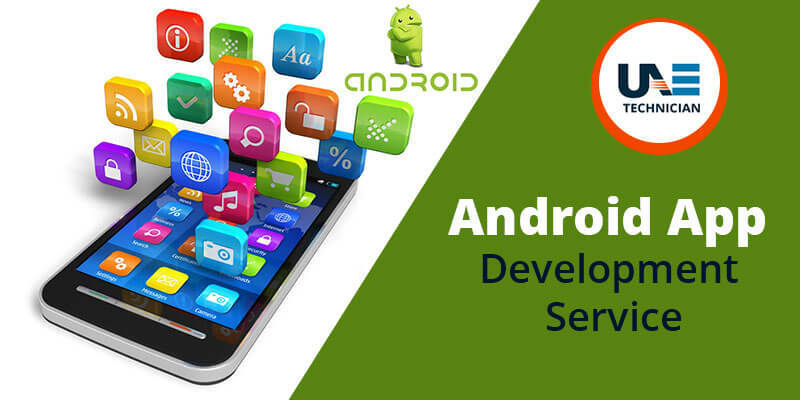 Our team consists of professionals who have in-depth knowledge about Android development. Hence, providing you with relevant services is not a difficult task for us. If we feel that you need a brand new application, we can gladly develop it for you. We care for your business and do the needful to boost your work. Additionally, we use the finest resources to provide you with services which meets the requirements of your business. Our team consists of engineers who have skills in programming languages like Java and hybrid languages like reactjs, ionic, flutter. Need Android developer in Dubai? You are in the right place. Do you need help regarding Android development? Are you desperately searching for Android developer in Dubai? Feel free to contact us anytime at our helpline number. In case you are getting a busy tone at our number, do not delay in sending an email. Additionally, we have designed live-chat sessions for you to provide you with an about Android development. Have faith in our services and stay in touch with to increase the visibility of your business. We also provide Hardware installation and troubleshooting service in Dubai.